The Bubble Gum Card War is the second book to be written by Dean Hanley. On average this book rates 4.5/5 stars on Amazon.com where it can be purchased in both paperback and kindle. Sales are still popular, even after being around for nearly two years. 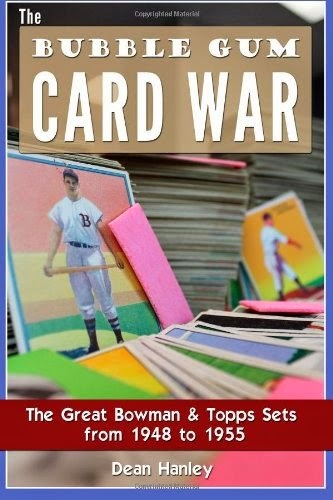 This book best describes the sets (and cards) from Bowman and Topps for the years of 1948-55. If you are a collector and ever wondered how these companies came to be, then it is a must read. This book has received both Amazon reviews and blog writer reviews. Yadier Molina who is a baseball enthusiast wrote a review of the book. It can be found on his web page by clicking here. There are a few categories on Amazon in which this book ranks. It is doing very well on the Kindle. 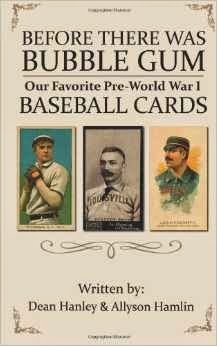 The first book Before There Was Bubble Gum: Our Favorite Pre-World War I Baseball Cards was issued in 2011. This book is filled with informative information about Pre-War cards and Sets. It follows right behind The Bubble Gum Card War for the kindle rankings. This book is also available in paperback. Dean's Cards offers a 100% Money Back Satisfaction Guarantee on all purchases. Just contact us within ten days of the purchase date and we will refund your money or, when possible, replace the cards. Dean Hanley, founder and owner of DeansCards.com, is considered one of the foremost experts on the subject of vintage baseball cards, other sports and non-sports cards and has a regular column in the Sports Collectors Digest and publishes articles on his blog. 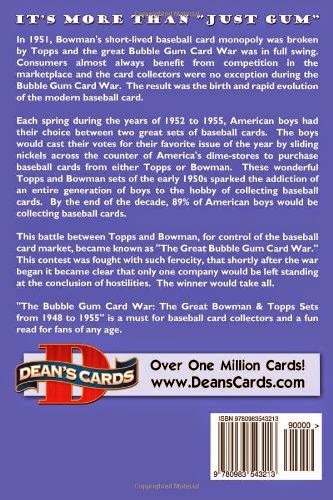 Dean has also written two books on vintage sports cards: The Bubble Gum Card War: The Great Bowman & Topps Sets from 1948 to 1955 and Before There Was Bubble Gum: Our Favorite Pre-World War I Baseball Cards. Both are available in eBook and paperback form. In Stock! 1962 Bubbles Inc Mars Attack Cards!